1) It's Chris Columbus for goodness sake. How could my Goonie-lovin' heart say no? 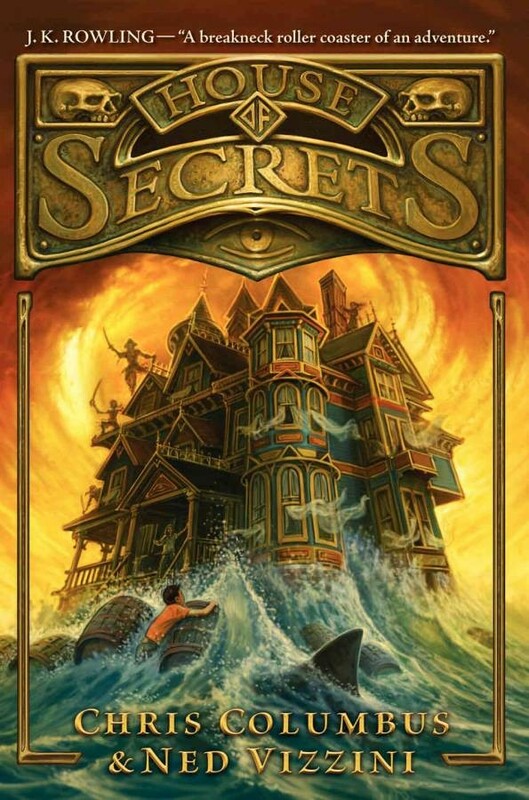 3) The blurb from J. K. Rowling: "A breakneck, jam-packed roller coaster of an adventure about the secret power of books, House of Secrets comes complete with three resourceful sibling heroes, a seriously creepy villainess, and barrel loads of fantasy and fear." 4) The main characters, three siblings, get sucked into a creepy author's stories — stories that come to life! Um... yes, please? 5) Look at the cover. Just look at it. Look at that creepy house. It begs to be explored. Finished FANGIRL. Guys, guys, guys. Wow. You gotta read it. The creep factor is out of this world. The water rushing out the windows reminds me of the start of The Dawn Treader, when the water gushes out of the painting, sucking the Pevensies back into Narnia. And then there's also something of a Percy Jackson vibe to the cover as well... It's all made of win! I read the book and it was fantastic!!!! I really enjoyed reading the book and i cannot wait for the second one! what was your favourite part in the book? mine was when they were kidnapped by the pirates!